A dispute over Gladstone Power Station's proposed changes to the site's Enterprise Bargaining Agreement continues. THE Fair Work Commission could be the guiding light Gladstone unions and power station leaders need after eight months of failed negotiations. Australia's national workplace relations tribunal agreed on Wednesday to be involved in negotiations for a new Enterprise Bargaining Agreement at Gladstone Power Station. Their involvement was agreed to at a conciliation meeting between the commission, unions and Gladstone Power Station (GPS) management. The Services Union confirmed the result of the meeting after lobbying against proposed changes to the agreement made by NRG. A four-week cool down period was recommended by the FWC deputy president Ingrid Asbury. Ms Asbury recommended NRG put their application to terminate the current enterprise agreement on hold for four weeks. She also asked the unions put their Protected Industrial Action, which workers strongly supported in a ballot vote, on hold at the same time. 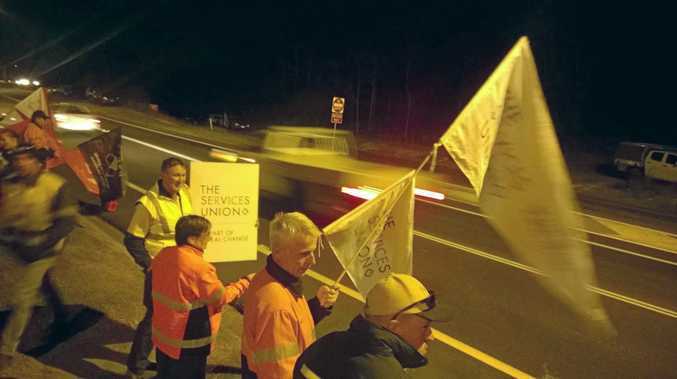 Just hours before GPS, union delegates and Ms Asbury discussed the best way forward, workers held up flags bearing the slogan "I will not sell my kid's future” at a protest over the EBA changes. At 5.30am workers lined the street outside the power station holding flags and signs. The Services Union secretary Neil Henderson attended the protest and said power station members were ready to take on NRG. "We are up for the challenge and the fight,” he said. The unions and GPS are set to meet again on June 13. Ms Asbury will meet with representatives from both parties on June 21 in a bid to negotiate a new EBA.